4 Comments on "Thanks for clarifying, Orbitz." What they really meant was: “this *trip* starts and ends at different airports”, which is unusual. Most airlines expect journeys to be perfectly round-trip. Just bad wording on Orbitz’ part. I wonder what would happen if I tried to book a flight from and to the same airport, though. 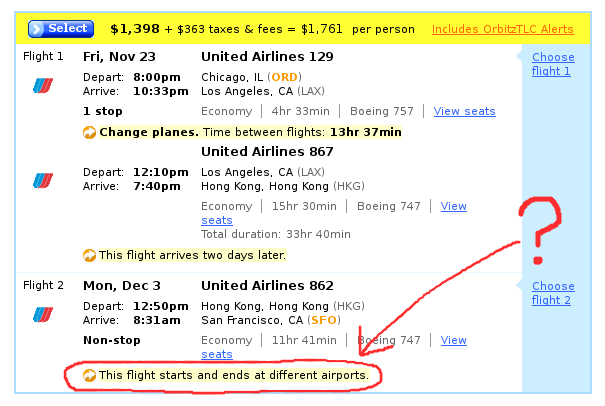 Let’s see, how about a round-trip from SFO to SFO? I kind of like their error message strategy: a human-readable message, followed by a code clearly intended for their programmers. Maybe Subversion should do the same thing? The Mount Everest sight seeing flight I went on a few years ago was labeled on the boarding pass as “from KTM to KTM,” I think. Hah! So it is possible! Previous Previous post: Weirdest spearphishing attack ever? Next Next post: Want to help fix the roof?